Putin.BLOG Finland Foreign Policy Joint news conference with President of Finland Sauli Niinisto. Welcome! I am sorry for keeping you waiting, but we had a lot of interesting topics to discuss. This year, Finland celebrates the 100th anniversary of its independence, and we very much appreciate the fact that President Putin came here and will join us in celebrating this event. At the same time, we are celebrating the 25th anniversary of relations between our countries. Once again, welcome. We very much appreciate your presence here. Currently, as befits good neighbors, we have extensive bilateral relations and ties. We are also witnessing some new life, an upswing in relations, as things are looking up in the economic sphere in both countries. There are more tourists going to both countries, and bilateral trade has picked up significantly. We also have common goals that we are striving to achieve. Notable is the toxic waste disposal site, Krasny Bor, near St. Petersburg. We discussed this issue last year. We made some progress, and samples were taken at this site. Indeed, our goal is to move forward in resolving this issue. We also talked about the projects that were implemented in the Baltic Sea region. We mentioned the sewage treatment plants that were put into operation in Kaliningrad, and this also serves as a reminder about the Northern Dimension initiative, which has come to a standstill due to sanctions, but I believe that, nonetheless, we should not forget about it and keep it alive, at least in our thoughts, because Northern Dimension allowed us to achieve a lot of good things. We can mention the treatment facilities in St Petersburg, and now the treatment facilities in Kaliningrad, too. We also talked about the security situation in the Baltic Sea region. We are planning major military exercises, West-2017 and Aurora. We are also keeping an eye on a certain intensification in the movement of military aircraft, ships, troops. In order for us to avoid negative consequences, situations that no one wants, we need to maintain dialogue. I also want to recall the interview that NATO Secretary General Mr. Stoltenberg gave. He described the recent NATO-Russia Council meeting as constructive. The need for this kind of ongoing dialogue is also clear from the discussions taking place in the working group at ICAO, in which the Russian Federation is represented, as well as the other Baltic Sea countries and NATO. Working in this format, we have reached agreement on best practice regarding aviation and flight safety. Discussion and examination of the issues related to turning on transponders during flights continue there, and in a positive spirit, as far as we know. We also discussed matters related to Finland’s chairmanship of the Arctic Council. Our country has only just taken up its functions as chair. 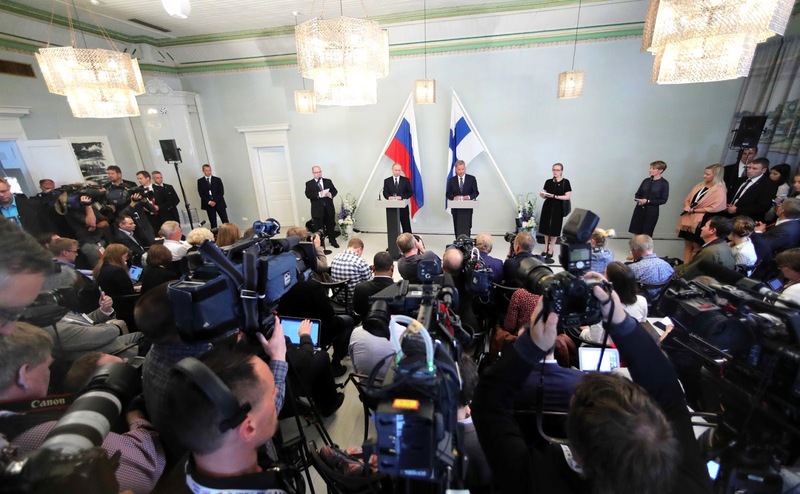 President Putin showed great understanding with regard to the idea I put forward, the idea that Finland would make a proposal that would be very difficult to reject. This proposal is about fighting black soot pollution. This pollution is caused by aging energy production facilities, power stations, and flaring associated gas. Fighting black soot pollution does not impair anyone’s economic interests. Our talks were very substantive and interesting. We did not even manage to discuss everything. We have not yet discussed Syria, for example, or disarmament, which is another issue I very much hoped to discuss. But during the boat trip we will have a chance to talk about these and other matters, and I think there will be some time for us to talk in the evening, too. Thank you very much for an interesting discussion. I want to start by thanking Mr. Niinisto for the invitation, all the more so in this year when Finland is marking the 100th anniversary of its independence. In this connection, we have a big program of joint cultural events. As for our talks, they took place in the constructive and friendly atmosphere, traditional for our contacts. This was our second meeting this year. We also visited each other in 2016. I am sure that this political dialogue is most certainly a positive factor for stimulating development of our bilateral ties. Mr. Niinisto already mentioned that this year also marks the 25th anniversary of the treaty on the foundations of relations between Russia and Finland. Today, we took a detailed look at the full spectrum of bilateral cooperation matters. We noted that our bilateral trade has picked up and posted an increase of close to 51 percent for the January-May period. Our common task is to support and do all we can to keep this pace going and preserve this trend. Our Intergovernmental Commission and Business Council are working on this. I note the consistently high reciprocal interest of our countries’ business communities. Investment cooperation continues to develop. Russia’s direct investment in Finland came close to $3 billion in 2016, and Finland’s investment in Russia came to nearly $4 billion, even more if investment made via Finnish companies’ subsidiaries in other countries is counted. We are also working on renewable energy sources. The company Fortum, for example, and our Rusnano are establishing a fund with more than $500 million to develop wind energy. Companies such as Valio and Nokian Tyres continue to develop their business activities. Our company Biokad plans to organize production of chemical and biological products in Turku. Yandex is launching a data storage center in Finland’s Uusimaa region, and there are other interesting projects too. During the talks we noted the efficient work of the environmental agencies of both countries. Mr Niinisto has already mentioned our joint work on hazardous waste at the Krasny Bor dump site near St Petersburg. We have just started this work. The renovation of Kaliningrad’s water supply system has been completed. This is a very serious, large step in ensuring environmental safety in the Baltic area in general. We intend to continue expanding our bilateral cooperation in environmental protection. We still have to discuss the settlement process in Syria. I promised to inform my colleague in detail about it but right now I can say that in our view the main task is to stop the bloodshed once and for all and ensure the necessary conditions for a peaceful political settlement. Then the Syrians should decide, in a broad-based dialogue under the aegis of the UN and on the basis of Security Council Resolution 2254, what kind of country they want to live in. I shared with the President the particulars of developments related to Ukraine’s domestic crisis. We continued our exchange of views on the issues I discussed with Mr. Niinisto at the Arctic: Territory of Dialogue forum in Arkhangelsk on March 30. We agreed to build up our cooperation in the region, in particular, considering Finland’s Chairmanship of the Arctic Council. I listened with interest to the President’s ideas on potential ecological cooperation in the Arctic. Needless to say, we can certainly do much in this area if we combine our efforts. I would like to thank our hosts for their hospitality and cordial reception. I would also like to thank Finnish citizens who met us on our way to this hotel for their friendly and warm attitude. They greeted me with friendly waves. I cannot wave back to each of them but I want to say hello to them through the Finnish media. My question concerns the military exercises conducted jointly by China and Russia in the Baltic Sea. I would like to ask President Putin: What message are China and Russia sending to others, what message do they want to send to other countries located in the Baltic Sea region? What does Finland think about this? What thoughts come to mind? With regard to Russia-China interaction, it is a full-scale and very broad strategic partnership that includes economy, politics, military-technical cooperation, and purely military affairs. We have been regularly conducting military exercises for many years now, and participating in what is called war games and contests for many years now. To reiterate, we do so both on land and at sea. The cooperation of Russia and the People's Republic of China in its entirety, including the military component, is a critical element of international security and stability. It is not directed against any third country. We are not creating military blocs or military alliances. In this case, our militaries are simply honing their skills, interacting, and this again sets a good example for cooperation in any region of the world, including the Baltics. We respect the neutral status of certain states of the Baltic region. However, we are ready for any form of interaction with the neutral states as well. We decided to revive the Main Naval Parade, which will be held in St Petersburg soon. Make no mistake, it is not about brandishing arms, but reviving traditions that are more than 100 years old. In fact, such a parade was held earlier, perhaps on a slightly smaller scale, on Russian Navy Day. We invite everyone to come to St Petersburg and enjoy the show. We are ready to invite our partners and countries of the region to participate in this event, and are ready to make it happen as a collaborative effort. Thank you. 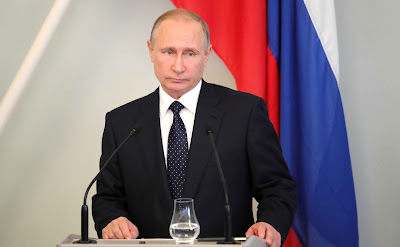 As far as I understand, and as President Putin mentioned, indeed, this is not the first time such exercises are conducted jointly by Chinese and Russian naval forces, or joint military exercises in general. The Chinese Navy was also in the Mediterranean, and now they are here in the Baltic Sea. Also, as far as I understand, in order to maintain combat readiness and military skills, it is important to conduct exercises in various conditions. Conducting these exercises here in the Baltic Sea does not imply that they are intended precisely for these conditions, it is just that it is important to conduct such exercises in variety of conditions. Importantly, Finland also conducts such exercises, and takes part in the exercises that take place here in the Baltic region. We will be taking part in major exercises named Aurora off the coast of Sweden. Of course, the Swedish forces will be the main participant, but other states, including the United States, will also take part. The purpose of the Aurora exercises is also not about brandishing arms or forming any blocs against someone, either. But as long as we live in a world with armies and military forces, we must bear in mind that such exercises will be conducted no matter what. A question for both presidents. At present we are noticing modest but positive dynamics in the development of bilateral trade, as noted at the news conference. At the same time it is difficult not to see that new and quite serious political risks are being added to the continuing economic risks. This, in turn, is exerting pressure on economic factors. Do you have apprehensions that the modest positive dynamics are threatened by the current situation in the world? We live in a complicated, contradictory and very fragile world. The task of the people who do the work we were called upon to do is to avoid these risks, curb and minimize them, and to work on areas and ways of cooperation that would lead us to development, to the consolidation of international relations, the economy and improved living standards for our citizens. This is what our meeting today was about. As for the future, we will have to wait and see. We will respond to emerging problems. Yes, indeed, it is just as you said. There are risks and threatening factors in this world, for instance climate change. We discussed this issue when we reviewed our agenda in the context of our chairmanship of the Arctic Council. In addition, we have rampant migration and these flows are probably partially determined by the first factor mentioned – climate change – and may grow in the future as a result. And, thirdly, there are wars – armed clashes and conflicts that are heating up in many places in this world. We need an open spirit of global cooperation on all of these issues. I believe in dialogue, and I believe it is possible to find solutions via dialogue. First, I have a question for President Putin. President Putin, with these US congressional investigations – and they are thoroughly underway – into allegations of Russian meddling in the US election, and with the possibility of US sanctions being tightened shortly, do you sometimes sit in your office in the Kremlin thinking about how badly US-Russian relations are going and regretting the day that Donald Trump was elected? First, as for the election of the President of the United States, this is not our business, and it is not up to us to assess Mr. Trump’s performance in his very high office. This is up to the American people. And the second point. We also have a question to the Finnish President. Wait a second, I have something else to say. I was just waiting for the English translation. Answering your question on whether I regret the worsening of Russian-US relations, I can answer directly: of course we regret this. It is a shame, because if we worked together, we could resolve the pressing issues that concern both Russia and the United States much more efficiently. I am speaking of solving acute international crises, tackling terrorism, nature conservation, resolving environmental problems, handling illegal migration, fighting organized crime and so on, and contributing to economic development ultimately. But we know we have many friends in the United States, and there are many sober-minded people. I hope that someday the current state of affairs will come to an end and we will move on to a qualitatively different kind of relationship, which we will strengthen and boost in the interests of the people of the United States and the Russian Federation. Yes, we also have a question for the Finnish President. It seems that Finland has to balance between Russia and its US allies, but now a certain split is emerging in the United States. Do you think anti-Russian sanctions should be toughened or do you share the opinion of President Trump and his desire to improve relations with Russia? (In English.) As for balance, I just want to remind you that at this event, an American TV company asked double the questions as others. (Retranslated.) Yes, Finland is building relations with neighboring countries. We have good, balanced relations with Russia. Finland is also building relations with other countries, the EU, and the United States. This is not about Finland balancing between these powers; this is about a process, an approach that should be used in other parts of the world as well. The point is that we are trying to understand each other. As regards maintaining relations with Russia, I would like to cite the discussions that took place at the NATO summit in Warsaw last summer. Its participants spoke of the necessity and urgency of dialogue, and as far as I can tell, Chancellor Angela Merkel and President Emmanuel Macron are making such efforts as well, and I think this is very good. Good afternoon, my name is Pavel Zarubin, Rossiya TV channel. I have a question for both leaders. I would like to continue with the high-profile issue of the new US bill on toughening anti-Russian sanctions. Naturally, this issue is high-profile also because in the last few days and weeks we have been hearing very tough criticism of this bill from many key European politicians and European agencies. After all, what is happening is that the United States wants to apply its laws to the territories of other countries, EU countries, and to make its bill transnational. Have you discussed this issue? What is your attitude to it? After all, as far as I understand, the independence and economic security interests of other countries are at stake. And I have a question for the President of Russia. If this bill is adopted, what will be Russia’s response? What will it be like? Are any Russian-US contacts possible on this matter? For instance, a telephone conversation with the US President. Thank you. As for the transnational character of US legislation, I have been talking about this for a long time, since 2007 (I think I spoke in Munich about this). It is exactly as I said. This practice is unacceptable – it is destroying international relations and international law. We have never accepted it and will not accept it. As for the reaction of other states of the world, it depends on the extent of their sovereignty and readiness to defend their own national interests. If the same happens in this case, it will cause particular regret because these actions will have aggravating factors. I would call them particularly cynical because they amount to an obvious attempt to use one’s geopolitical advantages in the competitive struggle in order to protect one’s economic interests at the expense of one’s allies, as in this case. We have not seen the final version yet and we do not have a final opinion on this matter. But we see that for a long period of time, there have been ongoing attempts to provoke us – many Russian diplomats were expelled with no explanation of the reason and diplomatic property was seized, which is beyond comprehension as it violates fundamental norms of international law regarding diplomatic relations. The sanctions are absolutely illegal from the perspective of international law and they violate the principles of international trade and World Trade Organization rules. As you know, we are being very restrained and patient, but at some point we will have to respond. We cannot tolerate this loutish behavior towards our country forever. But how we respond will depend on the final version of the bill that is being debated in the US Senate. In any case, we believe that whatever happens in the immediate future, in the long term we will certainly reach some strategic level of cooperation and agreement. I hope that ultimately this is what will happen. I do not quite agree with you with respect to imposing sanctions and observing laws. Probably, the rationale behind this is that there are certain assertions and concerns regarding the process of the US election. And, as you have rightly pointed out, a very heated debate on this matter has begun in the EU. For instance, the President of the European Commission, Mr. Juncker, mentioned this and posed this question. This issue is difficult and sensitive for the EU, and it is necessary to start the discussions between the EU and the United States as the proposed sanctions will have a direct impact not just on Russia but on other countries as well. This is why the EU is intensifying efforts on this matter. I support Mr. Putin in saying that we should try to better understand each other in the world, and I believe this would be in everyone's interests. 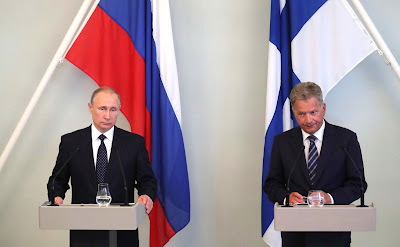 0 Comment to "Joint news conference with President of Finland Sauli Niinisto."